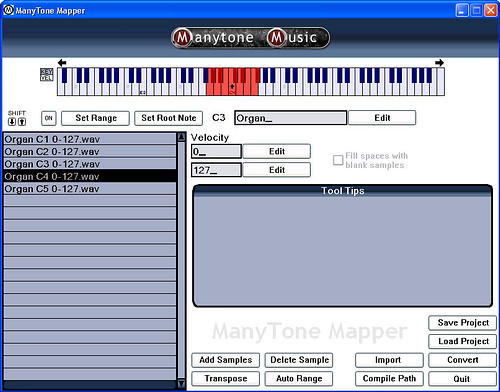 ManyMapper is a graphical sample mapping utility allowing you to quickly and easily create soundsets that can be used in ManyBass, ManyGuitar, ManyStation and ManyOne from wav files. ManyMapper also allows you to make SoundSets and sample mappings for WusikStation, as well as open and re-edit any WusikSnd file. exclude specific samples to build up different soundsets - for instance, it would be easy to strip out velocity layers to create "lite" soundsets. For further details about the product and how it works, click here to read the ManyMapper user manual.